Ford EcoSport: a Smart Car for the Masses | Donley Ford Lincoln of Mt. Vernon Inc. The Ford EcoSport is a car for the masses. The "world car" platform utilized by Ford has been adapted to car markets all over the world. This is a testament to the versatility and practicality the Ford EcoSport offers. The all-new EcoSport has been designed with the modern consumer in mind. It places a clear focus on the full integration of connected technology into the driving and ownership experience. The 8-inch touchscreen LCD center display employs a familiar interface, utilizing swipe and pinch to zoom functionality limiting the extra thought needed to manipulate. The display is connected with Apple CarPlay and Android Auto, keeping every aspect of your mobile life and entertainment right at your fingertips. 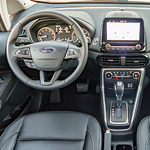 The Ford Sync3 system takes the integration to the next level, allowing for voice dialing and voice to text message composition. Ford also offers MyKey technology, which allows owners to fine tune preferences and vehicle settings based on the key used for entry. Parents can even limit stereo volume or max speed for their young drivers. The EcoSport has a lot to offer. Come check it out at Donley Ford Lincoln of Mt. Vernon.